This web site aims to summarize all that is known about butterflies and moths of West Africa, the 15 countries of sub-Saharan Africa that stretch from Senegal and Mauritania on the Atlantic to Niger and Nigeria in the east. West Africa has been earmarked as one of the world’s hotspots of biodiversity, because its rainforests, the Upper Guinean forests, are home to a large number of animal and plant species occurring nowhere else on the earth’s surface. The peculiar flora and fauna of this area can be attributed to its isolated position: the forests are separated from the rest of the African rainforests by the Dahomey Gap, an extension of the woodland savannah of the Sahel to the Gulf of Guinea. West African forests are however disappearing rapidly and most of their tropical biodiversity is unlikely to survive due to habitat destruction and fragmentation as a result of human population growth, deforestation, (bush meat) hunting, and climate change. The Upper Guinean forests are the most fragmented forests in Africa and the occurence of many plant and animal species is currently restricted to national parks. More so than the parks in central and east Africa, West African national parks are ecologically isolated, very accessible, and surrounded by high population densities of people with a meat-eating culture. Hence, we conclude that West Africa is an extraordinary concentration of biodiversity in need of urgent conservation. For an effective conservation policy, basic information is needed on the distribution of each endangered animal or plant species in West Africa and the specific regions in which they are concentrated. The next step involves learning more about the habitat requirements of each species. Given the substantial number of species and our lack of knowledge about them, practicability prohibits an exhaustive study within a time frame relevant for conservation. Hence, we must rely on indicator species to assess the health of ecosystems and to set conservation priorities. To raise public awareness on the beauty, diversity, and importance of the West African butterfly and moth fauna. To describe and illustrate all West African butterfly and moth species so that they can (easily) be identified. Particularly for moths, the existing literature is scattered among a large number of publications and contains few illustrations. To give the distribution for each species in the region considered and for Africa as a whole. To indicate each species’ habitats, habits, frequency, and host plants as documented in extant literature or personally observed. 1. ^ Myers, N., R.A. Mittermeier, C.G. Mittermeier, G.A.B. da Fonseca, and J. Kent (2000), “Biodiversity hotspots for conservation priorities”, Nature, 403: 853-858. 2. ^ Brooks, T., A. Balmford, N. Burgess, J. Fjeldså, L.A. Hansen, J. Moore, C. Rahbek, and P. Williams (2001), “Toward a Blueprint for Conservation in Africa”, BioScience, 51, 8: 613-624. 3. ^ Brooks, T.M., R.A. Mittermeier, C.G. Mittermeier, G.A.B. da Fonseca, A.B. Rylands, W.R. Konstant, P. Flick, J. Pilgrim, S. Oldfield, G. Magin, and C. Hilton-Taylor (2002), “Habitat Loss and Extinction in the Hotspots of Biodiversity”, Conservation Biology, 16, 4: 909-923. 4. ^ Brashares, J., P. Arcese, and M.K. Sam (2001), “Human demography and reserve size predict wildlife extinction in West Africa”, Proceedings of the Royal Society B, 268: 2473-2478. 5. ^ Brashares, J.S., P. Arcese, M.K. Sam, P.B. Coppolillo, A.R.E. Sinclair, and A. Balmford (2004), “Bushmeat Hunting, Wildlife Declines, and Fish Supply in West Africa”, Science, 306: 1180-1183. 6. ^ Gonzalez, P. (2001), “Desertification and a shift of forest species in the West African Sahel”, Climate Research, 17: 217-228. 7. ^ Malcolm, J.R., C. Liu, R.P. Neilson, L. Hansen, and L. Hannah (2006), “Global Warming and Extinctions of Endemic Species from Biodiversity Hotspots”, Conservation Biology, 20, 2: 538-548. 8. ^ Beier, P., M. van Drielen, and B.O. Kankam (2002), “Avifaunal Collapse in West African Forest Fragments”, Conservation Biology, 16, 4: 1097-1111. 9. ^ Struhsaker, T.T., P.J. Struhsaker, and K.S. Siex (2005), “Conserving Africa's rain forests: problems in protected areas and possible solutions”, Biological Conservation, 123, 1: 45-54. 10. ^ Kremen, C. (1994), “Biological Inventory Using Target Taxa: A Case Study of the Butterflies of Madagascar”, Ecological Applications, 4, 3: 407-422. 11. ^ Lawton, J.H., D.E. Bignell, B. Bolton, G.F. Bloemers, P. Eggleton, P.M. Hammond, M. Hodda, R.D. Holt, T.B. Larsen, N.A. Mawdsley, N.E. Stork, D.S. Srivastava, and A.D. Watt (1998), “Biodiversity inventories, indicator taxa and effects of habitat modification in tropical forest”, Nature, 391: 72-76. 12. ^ New, T.R. (1997), “Are Lepidoptera an effective 'umbrella group' for biodiversity conservation?”, Journal of Insect Conservation, 1, 1: 5-12. 13. ^ Boorman, J. (1970), West African Butterflies and Moths, London: Longman. 14. ^ Larsen, T.B. 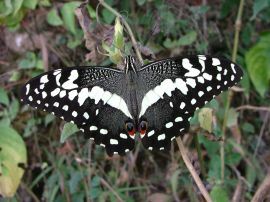 (2008), “Forest butterflies in West Africa have resisted extinction... so far (Lepidoptera: Papilionoidea and Hesperioidea)”, Biodiversity Conservation, 17, 12: 2833-2847. 15. ^ Larsen, T.B. (1994), Butterflies of West Africa, Stenstrup: Apollo Books.